Mary Wang has practiced Chinese traditional as well as western medicine for 13 years in China as a Family Physician. After coming to the U.S., she became a Therapist providing therapeutic massage services at The Grand Spa, MGM Grand and Canyon Ranch Spa Club at Venetian, both in Las Vegas, Nevada. During the course of her practice, Mary was able to produce a long list of satisfied clients, such as golfer Tiger Woods, New York Giants Quarterback Eli Manning, Olympic Gold Medalist Svetlana Khorkina, former Toyota USA President & CEO Yuki Togo, and numerous celebrities in the United States and across the globe. 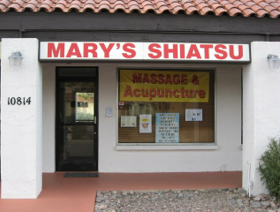 Mary offers a range of massage services available from world class spas at the same or better quality for a fraction of the price. At the Northwest corner of Scottsdale and Shea, facing Scottsdale road.